Pear-themed art! Pear cocktails! At Somerville Open Studios, it’s Pearapalooza. 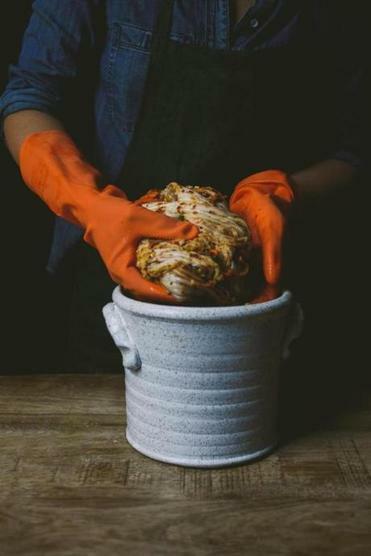 Kimchi that was fermented in a hand-crafted clay crock by Jeremy Ogusky. At this year’s Somerville Open Studios, art meets food — more specifically pears, one of the most aesthetically pleasing edibles. It’s Pearapalooza, a collaboration between artists and chefs, organized by sculptor Laura Baring-Gould (you may have spotted her giant bronze Clapp pear, bringing balance to a Dorchester corner that’s also home to a KFC) and potter/Boston Fermentation Festival founder Jeremy Ogusky. Chef Tracy Chang (the soon-to-open Pagu, Guchi’s Midnight Ramen) will serve pear shaved ice, while Dave Becker of Sweet Basil and Juniper (and also a potter) is making pear-turnip dumplings. Ogusky will teach a class on making pear kimchi, and pear tarts and pear cocktails will also be on offer. (Small donation requested.) Pear-themed art by Baring-Gould, Ogusky, potter/sculptor Hannah Niswonger, and painter Bill Chisholm is for sale. Pearapalooza is at 204 Summer St., Somerville, April 30-May 1, noon-6 p.m. For a schedule and information, go to bit.ly/celebrationofpears.